(God sends Fire) - (Kings 18:21-39) In this lesson children learn that God gives us everything we need. 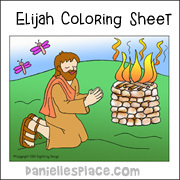 Children learn how God took care of Elijah and that he takes care of them. They act out the story as the teacher reads the story. 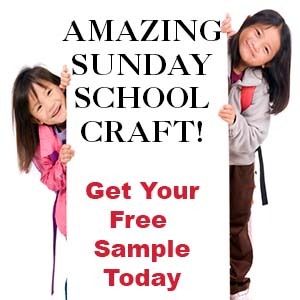 A complete lesson with all the crafts and activities below is available to members on The Resource Room and as an instant download. Bring in paper grocery bags or lunch bags and have your children help you make "stones" for an activity they will be doing during the lesson. Cut up pieces of newspaper and have them crinkle up the paper and place it into the bags and then tape them closed with masking tape. If you have younger children, make the "stones" ahead of time and have your children practice making altars. 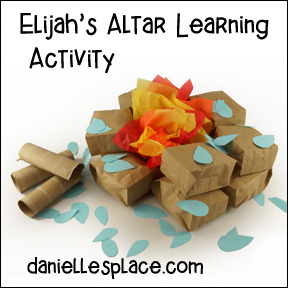 Explain that altars were used to give offering to the Lord to pay for the sins of the people. They were also built where someone talked to God or at a special place so the people would remember what happened there. A complete lesson is available to members on The Resource Room and as an instant download above. 1. 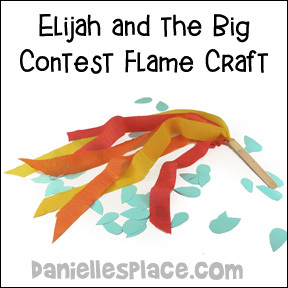 Before class cut off two to three feet lengths of crepe paper streamers. Use red, yellow, and orange. 2. Staple them together at one end and cut the ends to a point at different lengths and then wrap the ends with tape around the craft stick. 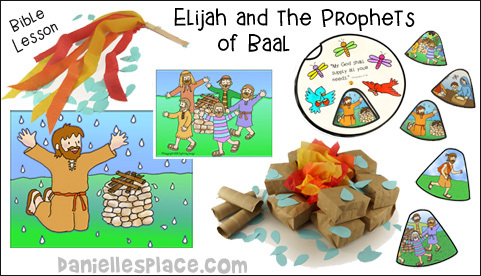 Have the children use the banners while singing the songs about Elijah and the Prophets of Baal and during the lesson. A complete lesson is available to members on The Resource Room and as an instant digital download above. 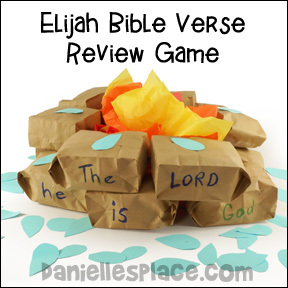 Write the Bible verse, one word per stone, on the paper bag stones used in the lesson. Write the Bible verse on the board and review it. Have the children stand in a circle. Give the them all the stones. Tell them to pass the stones around the circle while you play some music. 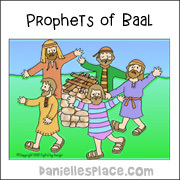 When the music stops, the children who are holding the "stones" should say the Bible verse. 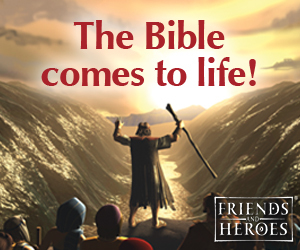 The child holding the word "The" would start, then the child holding the word "Lord" would say his word, etc. Start the music again and keep playing until all the children have had a chance to say a word of the verse. You can play this game in different ways depending on the age of your children. If you have children that cannot read, you can just use one rock and have the children pass it around the circle. When the music stops, the child holding the stone says the Bible verse. 3. 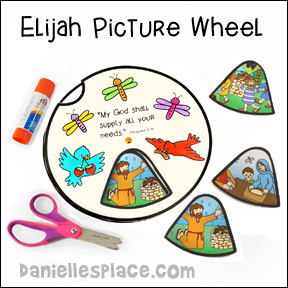 In class have your children color the top wheel pattern and then glue the pictures on the bottom wheel in the order of the story. 4. Place the top pattern on the bottom and punch a hole through both in the center. Use a brad to fasten them together. Children turn the wheel to see the pictures. 2. Hang them up on the wall in random order. Have the children take turns coming up to the wall and placing the pictures in order. Discuss the pictures and how they relate to the story.